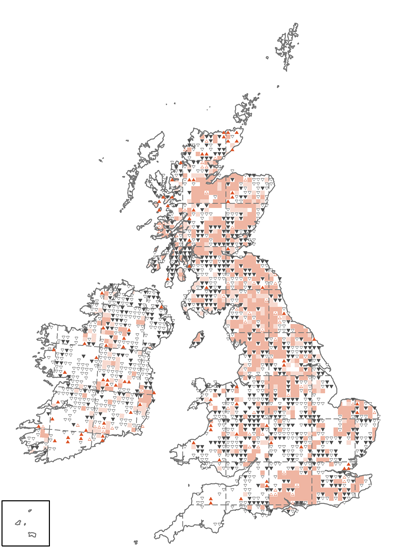 Woodcock breeding distribution change map 2007-2011. Please find below details of the survey instructions and recording forms which can be printed and taken into the field, so data can be subsequently entered on-line. You will also find other useful survey and supporting information. The 2013 survey will be instrumental in helping to understand the changes in distribution that have been detected between the 1968-72 and 2008-11 Breeding Atlases (map opposite). Although there is good continuity of occupation in the core breeding areas (pale and dark pink squares) and some recent gains (orange triangles) there have been substantial losses (open and grey triangle). It is essential to be familiar with the calls made by Woodcock before commencing your survey. The following examples cover all the main calls likely to be encountered. GWCT have undertaken a fascinating Woodcock tracking project which has revealed some incredible journeys. A total of 12 individuals were tagged at sites throughout Britain during the 2011/12 winter and their migration tracks show the routes taken to reach their distant breeding sites. Breeding locations include Scandinavia and western Russia but one had travelled deep into central Russia. Now you can view their return journies as they arrive back at their wintering sites.